An hour’s drive south of Florence, Siena is one of the most beautiful cities in Tuscany. It rests on three red clay hills and has retained its orginal medieval atmosphere with steep narrow streets and predominantly Gothic architecture. 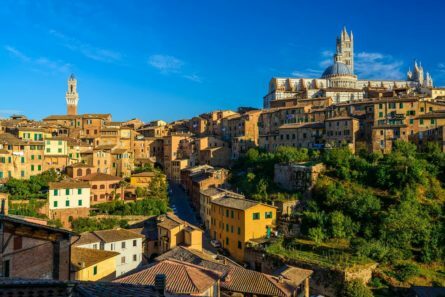 Italy’s Best introductory Siena Tour includes all the major sites of this charming hilltop town, believed by many to be quintessential Tuscany. See Piazza del Campo, the spectacular shell-shaped square where the world famous Palio horse race occurs twice a year. The race converges in front of Palazzo Pubblico, the seat of Siena’s government since the 13th century as well as a museum containing magnificent frescoes by prominent 14th century Sienese artists (optional). Go inside the Duomo, the city’s magnificent Romanesque/Gothic Cathedral which houses paintings and sculptures that span several centuries and an extraordinary marble inlay floor, a magnificent series of colored and engraved marble pictures that took two centuries to create. You could choose to visit the Museo dell’Opera (cathedral museum) which houses Duccio’s glorious Maest that once decorated the cathedral’s high altar or the recently discovered “crypt”, a series of underground rooms decorated with unusual frescoes. This discovery, believed to have been part of the early cathedral, has impacted the course of Sienese art history. During this cooking class in Tuscany, experience a private lesson in a home kitchen in Chianti. Cook surrounded by the Tuscan hills & dine on your creation. During your private Lucca & Pisa shore excursion, your private driver will bring you to some iconic Tuscan destinations, including the Leaning Tower. This half-day family day trip in Tuscany includes a visit to a farm with an authentically prepared Tuscan meal. View the animals and enjoy tastings. Become a winemaker for a day during this Tuscan winemaking lesson. After a short lesson, make your own wine and then enjoy a lunch at a lovely villa. Learn the process of winemaking from a professional Tuscan winemaker, and then get the chance to create your own!